This October, Hillsboro will be celebrating its 4th annual Arts Month, an initiative to raise awareness for the quality, diversity and value of the arts in our community. Building on the popularity of National Arts & Humanities Month, observed throughout the United States for many decades, our local initiative is orchestrated by the Hillsboro Arts & Culture Council and the City of Hillsboro’s Cultural Arts Division. The campaign is open to participation by all area artists and arts organizations. ArtFest on the Plaza, will be returning this year on Saturday, September 22 in conjunction with the Hillsboro Farmers’ Market, as a kickoff celebration and way to promote your upcoming events to the community. The call for stage performers is currently open, and we will soon open the call for booth space. Arts Month is a great way to engage the entire community, grow audiences, and celebrate the amazing creativity and talent throughout our city. But we need you, to help spread the word! Post your October events to http://www.tvcreates.org/calendar-of-events/, the community’s free, online calendar for arts and culture in Washington County. Include the www.hillsboroartsmonth.org link on your website and social media. Download the Arts Month logo and use it in your promotional materials for October. You can also insert a pre-designed Arts Month ad in your newsletter or program, or include a pre-designed Arts Month header or footer on your e-nail or poster to let people know it is an Arts Month event. If you have the opportunity, remind your audience that October is Arts Month, and suggest another event for the public to attend throughout the month. The best promotion for happenings in Hillsboro is always by word of mouth! Share information about Arts Month with your Board of Directors and staff. Contact us if you would like a personalized information session about what Arts Month can do for your organization and for Hillsboro. We are happy to attend your board or staff meeting. Share your inspiring or newsworthy Arts Month stories with the Cultural Arts office by emailing us event details at HACC@hillsboro-oregon.gov. Encourage your friends, family, and colleagues to learn more about Arts Month by sharing our website, www.hillsboroartsmonth.org. Like us on Facebook, share our posts, and tag your own experiences with #HillsboroArtsMonth. October is Arts Month! We’re having a special event/class/sale/exhibit to celebrate starting on (dates and times). 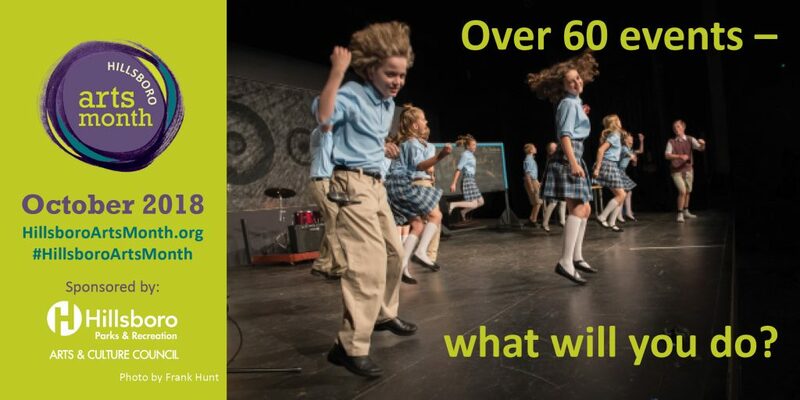 Visit HillsboroArtsMonth.org to learn how to become involved. Take the Arts Month challenge by participating in a new arts experience in Hillsboro this month! Need ideas? Stop by our studio/theater/booth for a demo/event/class on (date and time) for a great time, and learn more about other events in Hillsboro to do this month by visiting www.hillsboroartsmonth.org. Did you know: there are over 60 opportunities to see and do something new for Hillsboro Arts Month this year? Our organization is a great place to start! Join us for event/class/exhibit, and create, participate, celebrate the arts!